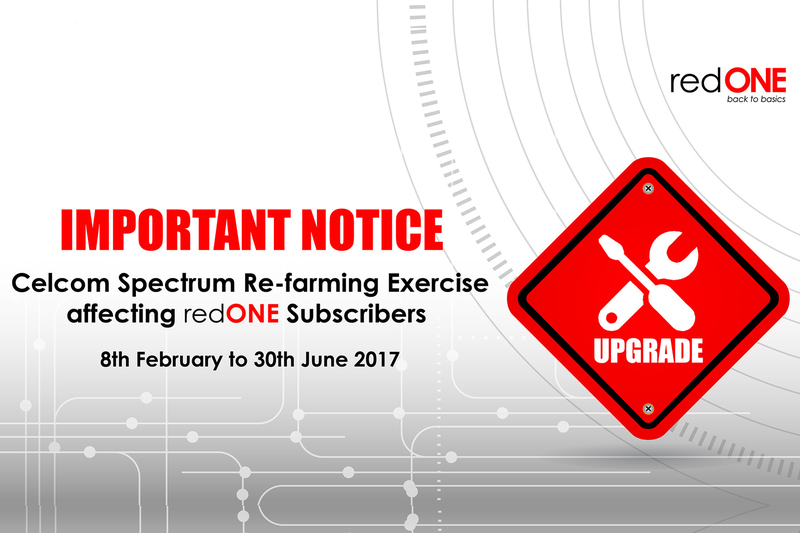 Celcom Spectrum Re-farming Exercise affecting redONE Subscribers from 8th February to 30th June 2017. This Spectrum Re-farming Exercise follows the reallocation of spectrum in the 900MHz and 1800MHz spectrum bands announced by MCMC on 1 February 2016. Celcom will be conducting their Spectrum Re-farming Exercise, this will provide the latest mobile services utilising technologies to redONE users. During this exercise, Celcom will reconfigure the spectrum for each and every site, thus, redONE subscribers may experience temporary intermittent service disruptions for 2G, 3G and 4G services (i.e. degradation of connectivity for calls, SMS and Internet) in the affected areas. Why is Celcom carrying out the Spectrum Re-farming exercise? Following Malaysian Communications and Multimedia Commission (MCMC) directive and announcement on 1 February and 30 September 2016, Celcom is required to do re-farming to its network frequencies. How will the re-farming exercise be done? Celcom will be reconfiguring our network, where we will migrate our base stations to operate within the allocated spectrum. This remote reconfiguration will be done in stages, affecting a certain location at one time. After each reconfiguration exercise, optimisation work will take place to ensure that you will enjoy the same network quality as before. How will the re-farming exercise affect the customers? Will the service resume to normal immediately after the exercise? There is a possibility where you may experience degradation of connectivity for voice calls, SMS and internet, primarily for 2G network during the re-farming exercise in the affected areas. After the re-farming exercise, intermittent disruptions for voice calls, SMS and internet may occur as we carry out the optimisation work, however, we will be working hard to keep this to a minimum. What time of the day that re-farming exercise will be done? To minimise the impact on you, the re-farming exercise will be done between 12am- 4am, on the days scheduled for the exercise.